Gabriel Consulting Group’s recent annual x86 Data Center Surveys have shown that the average x86 enterprise customer is using three different hypervisors to virtualize their workloads. Their latest survey shows that most customers aren’t simply test-driving them in hopes of finding the “One True Hypervisor.” They have solid reasons, primarily focused on cost and technical differences, for using multiple solutions and will continue to do so for the foreseeable future. 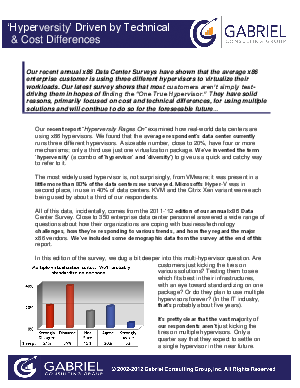 This survey digs deeper into the multiple hypervisor question.